The poster for Moammar Rana and Sonya Husyn’s upcoming film Azaadi has been released and needless to say, it promises an intense film. The movie will be screened across cinemas in Pakistan on Eid-ul-Fitr. Moammar Rana plays a freedom fighter hell-bent on fighting occupation forces in Indian-administered Kashmir. Sonya Husyn will play a journalist who closely follows Rana’s pursuits and realises there’s a different side to him. 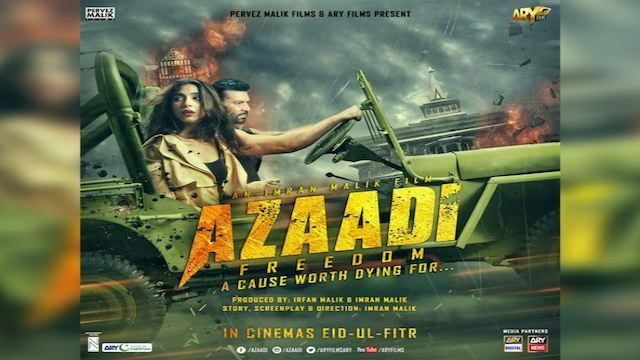 Imran Malik, the son of veteran film producer/director Pervez Malik, will be making his directorial debut with Azaadi. Songs by Quratulain Baloch, Rahat Fateh Ali Khan and Shafqat Amanat Ali will be featured in the movie.